Kettering Town boss Marcus Law believes there’s more pressure on Leamington than his own team as they prepare to lock horns in a crucial encounter at Latimer Park tonight (Tuesday). The Poppies’ magnificent run of form continued at the weekend as they extended their unbeaten sequence to 10 matches with a 3-0 victory at Chesham United. The win moved Law’s team into the Evo-Stik Southern League Premier Division play-off places for the first time this season. Leamington sit in fourth following their 2-0 success over Paulton Rovers but the Poppies could leapfrog them by beating them tonight and, crucially, still have two games in hand. 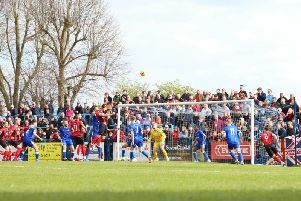 With leaders Poole Town still not out of reach for either club, it only adds to what is a huge game. But Law believes Kettering’s remarkable turnaround in the past few weeks has helped ease the pressure on him and his players. “We have been in the same situation since the start of March so this is nothing new for us,” Law said. “People will look at it as fifth versus fourth and say it’s huge but I think there’s more pressure on Leamington than us because we have the extra games. “If we have got aspirations of Poole slipping up then yes, it’s crucial we win. But if our aim is the play-offs then we could certainly do with not losing. “When it comes to general pressure on us, I think things have gone the other way. “I think we have surprised a few people, including our own fans, with the run we have had. “I am not sure many would have expected us to have an outside shot at the title and a good chance of reaching the play-offs a little while ago. Law confirmed Gary Mulligan’s knee injury will be assessed ahead of tonight’s game but insists the Poppies “won’t be taking any risks”. And the manager also delivered a positive update on striker Spencer Weir-Daley, who has missed the last two matches after suffering a dislocated shoulder in an accident at home. “Gary was given a programme to go through yesterday and we will see how he has reacted to that,” Law added. “We still have a lot of games to come and we won’t be taking risks with anyone.